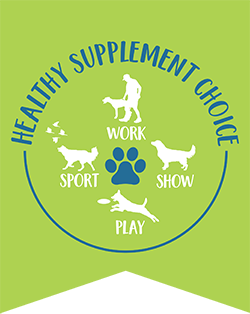 Coconut Oil given orally supports your pet’s metabolism, reduces inflammation, promotes oral health, balances hormones, eases joint pain, improves digestion, protects organ function, improves heart health, thyroid function and healthy skin and coat. Coconut Oil can be also be applied topically. It is a natural antibacterial and anti-fungal which promotes wound healing and prevents and treats yeast infections. Coconut oil for skin is an excellent moisturizer, it can penetrate hair better than other oils, and , well it smells like cookies. 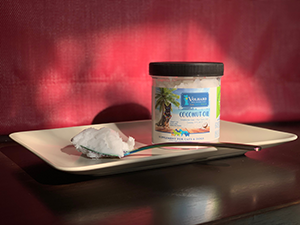 Volhard Coconut Oil is humanely sourced, hexane free, cold pressed in small batches, unrefined, non- bleached, contains 62% Medium-chain triglycerides (MCT) and is high in Lauric Acid. What benefits can seen when using Coconut Oil? This nourishing oil has been used for centuries in hair and its unique fat composition makes it especially beneficial for certain hair types. 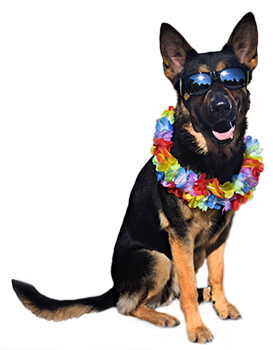 Aids flea allergies, contact dermatitis and itchy skin, Minimizes doggy odor, Reduces allergic reactions, Creates sleek and glossy coats, Prevents and treats yeast and fungal infections. When applied topically coconut oil promotes wound healing. Also can help with hot spots, dry skin and hair, bites and stings. The concentration of beneficial fats in coconut oil makes it helpful for digestion. Its antimicrobial properties can help fight irritation and infection in the gut from Candida.Increases nutrient absorption, Helps with colitis and inflammatory bowel syndrome, Reduces or eliminates bad breath, and Helps with coughing. Studies show MCTs may contribute to focus and mental performance.MCTs make a quick energy source because they don’t rely on other enzymes for absorption in your body. On the ketogenic diet, MCTs are a source of fat that can quickly boost energy levels by increasing ketone production effectively. Getting the wrong kinds of fats can create havoc on hormones. Coconut oil contains specific fats that support the dog’s natural hormone production. Coconut oil is a stable oil that doesn’t break down easily at high temperatures like other oils do. It doesn’t go rancid easily and has amazing nutritional properties. It is great for cooking meat for Volhard diets and making treats!